Does Eric Thames deserve the “Mr. April” nickname? There have been countless marvelous nicknames handed out in baseball history. Of all the major sports, baseball is a step above the rest when it comes to imaginative monikers. There’s The Great Bambino, Shoeless Joe Jackson, Hammerin’ Hank and Mr. October. There’s also The Big Hurt, The Big Unit and Kung Fu Panda, along with numerous other creative titles. In Milwaukee, we currently call Travis Shaw “The Mayor of Ding Dong City”, and we used to swoon over El Caballo (Carlos Lee) back in his playing days. And now, after another powerful April, we’ve given out another nickname to Eric Thames. Over the past two seasons, the Brewers first baseman has 18 home runs in the month of April. He crushed 11 in April 2017 during his return to Major League Baseball, and as of April 22, he has seven over-the-wall hits in 2018. It’s not a stretch to say he’s been nothing short of phenomenal during the season’s opening month, but does he really deserve the “Mr. April” nickname that so many people — myself included — have called him? Let’s find out. Before the 2017 season, the last time Thames played professionally in the states was in 2013, when he spent time in the Orioles’ and Mariners’ minor-league systems. He had just 684 major-league plate appearances in his career up to that point, and he eventually decided to take his talents to Korea. Therefore, because Thames’ body of work is so small, it would be unfair to compare him to players with much larger sample sizes. Like Barry Bonds and Albert Pujols, for example. Bonds is the owner of the award for most home runs during the season’s first month in MLB history with 117, and Pujols is a close second with 107. Thames has 20 April home runs. To his credit, though. Bonds and Pujols have more plate appearances in April alone than Thames does across his entire career. So, for the sake of this argument, I’m just going to be looking at the last two seasons. It’s not perfect, but who cares? Let’s first start by looking at Thames’ performance the last two Aprils. (Note: When I say April, I’m including March, as well). Those numbers are impressive. Really impressive, actually. Thames has created 94 percent more runs than league average in the month of April, and has hit just as many home runs as Joe Mauer has in the last two full seasons combined. Granted, Mauer isn’t necessarily considered a power hitter, but you get the point. Thames has been fantastic in April. I’ve established that numerous times in this article already, and I’m only 383 words in. We still haven’t gotten to the main question, though; does Thames deserve the Mr. April nickname? If he hasn’t been the best hitter in that month over the last two seasons, he shouldn’t be blessed with that moniker. I don’t think anyone could disagree with that. I realize that two years is an incredibly small sample size, especially when handing out a nickname, but let’s just have some fun with it. The three categories I’ve chosen to evaluate are home runs, isolated power percentage and OPS. I would prefer to use wRC+ and wOBA, but Baseball Reference’s Play Index fails to list those as options, so isolated power and OPS are the next best things. If Thames is leading the way in all three of those offensive categories, then I will admit he absolutely deserves the nickname. Thames wins this one. Bryce Harper and the powerful Aaron Judge are right on his heels, though, and both could easily surpass him before this month’s up. Now, let’s look at the isolated power numbers (minimum 100 plate appearances). The top four are the exact same as the home-run list, but there’s a few new names toward the bottom of the list, with Matt Kemp being the most surprising. Thames is once again on top of the leaderboard, and is well on his way to officially taking the Mr. April crown. An upset! Due to an incredible start to the season, Harper takes down Thames with a slightly better OPS. However, even though I said Thames could only be nicknamed Mr. April if he leads in all three categories, I’m still going to give it to him. Because the fact is, he deserves it. In addition to Thames’ above accolades, he also ranks sixth in on-base percentage, third in total bases and fourth in runs created. In terms of offensive production and providing value with the bat, no one has been better than Thames in April since he made his triumphant return from Korea. This isn’t the best way to determine the top hitter in a given month, and there’s obviously many more stats I could’ve dived into to further my research, but at the very minimum, it shows that calling Thames “Mr. April” actually makes a whole ton of sense. If he can put together three or four more Aprils of this magnitude, maybe the nickname will stick for years to come. Until then, though, every time Thames comes to the plate as this month winds down, it’s a safe bet he’ll find success. After all, they don’t call him Mr. April for nothing. This entry was posted in Analysis and tagged April, Bryce Harper, Eric Thames, Milwaukee Brewers on April 23, 2018 by Justin Schultz. With the invention of StatCast, we have the capability to see just how hard a batter hits the ball. Being able to determine exit velocities has transformed the way we evaluate players, and it allows us to measure player performance on a more accurate level. In other words, StatCast is amazing. According to my Baseball Savant query, there were 165,566 balls put in play in 2017. Of those, only 15,799 (10.4 percent) were hit with an exit speed of 100 mph or faster. Batters hit .651 with a whopping .844 wOBA on those balls, while they batted just .253 with a .249 wOBA on exit velocities that failed to reach the century mark. The lesson learned here: hit the ball hard. Exit velocities can also let us know if a hitter is having good or bad luck. For example, if a hitter has a low batting average on balls in play but has a relatively high hard-hit rate, it’s likely the said hitter has been bitten by the bad luck bug. Chances are his misfortune will eventually turn in his favor. Unless, of course, he’s someone like Joey Gallo, who will always have a low BABIP because most of his batted balls go over the fence. The Milwaukee Brewers just finished their first full week of the season, and currently sit in third place in the NL Central with a record of 5-5. And quite frankly, they’re lucky to have five wins. They just lost three of four to the Chicago Cubs, a series in which the Brewers managed just one hit with runners in scoring position. After a strong start in San Diego, Milwaukee’s bats have cooled off, so I thought it would be an interesting exercise to look at the team’s exit velocities after 10 games to see which players are over performing/underperforming. As a team, the Brewers rank 26th in average exit velocity with a mark of 86.4 mph. The Chicago White Sox lead baseball with an average of 91.8 mph. Individually, the average hitter hits the ball at 88.2 mph. Let’s look at Milwaukee’s hitters to determine who’s contributing to the team’s low velocity numbers. Note: All stats are as of April 7. Sunday’s finale versus the Cubs is not included. All stats courtesy of Baseball Savant. Only four players have exit velocities that are better than league average, and one of them is Jett Bandy, who’s put just six balls in play so far. The Brewers desperately need Christian Yelich back in the lineup. He ranks fourth in all of baseball in exit velocity and has a .474 BABIP. Manny Pina is really struggling to make strong contact. His xwOBA is much higher than his wOBA, but the fact he’s averaging only 79 mph on batted balls is worrisome. Ji-Man Choi made the most of his one at bat on Opening Day. I thought Orlando Arcia would take a huge step forward in 2018, and although it’s still early into the season, he’s continually hitting soft grounder after soft grounder. He has a 60 percent ground-ball rate and a 40 percent soft-hit percentage. Eric Thames looks good at the plate, and the peripherals back it up. Domingo Santana has crushed the ball, but hasn’t found any gaps yet. He has just one extra-base hit. Lorenzo Cain leads the team with 11 batted balls of over 100 mph. His hardest hit ball was 111.6 mph off Brian Duensing that resulted in a double. The Brewers have 48 batted balls that have reached 100 mph or faster off the bat. That’s the 11th most in baseball, which is strange considering how low they rank in average exit velocity. The Brewers have a dangerous offense. The additions of Yelich and Cain have made their lineup a force to be reckoned with, but 10 games into the new season, the offense has struggled. And a lot of that has to do with the quality of its batted balls. It’s still early, so the numbers in the table are still fluctuating by large amounts with each new batted ball, but if in a month, Milwaukee’s exit velocity numbers are still in the gutter, then we may want to take more notice and start worrying. This entry was posted in Analysis and tagged Exit Velocity, Milwaukee Brewers on April 9, 2018 by Justin Schultz. Does Orlando Arcia have 25-homer potential? Usually, when I begin writing an article, most of my research has already been researched. I know exactly how the article is going to begin and end, because, like I said, my research has already been completed. This piece is different. Upon starting the piece I had done no research. I was reading a baseball chat hosted by FanGraphs, and someone mentioned the fact that Orlando Arcia could break out, particularly in the home run department. I wanted to see if I agreed with that premise based on what we’ve seen from Arcia thus far, so I started writing and researching simultaneously. The question I posed in the title is a question I didn’t know the answer to until I completed the article. It was a fun little exercise, and it was a fun change of pace from what I’m normally accustomed to. Orlando Arcia has never been considered an elite hitter. Even when Arcia was one of the top prospects in all of baseball and was coming off a Double-A season in 2015 in which he hit .307 that was accompanied by a .347 on-base percentage and a 126 wRC+, his skills with the bat still came as an afterthought. It was his defense that propelled him as he made his way through the Brewers farm system, and, as a shortstop, being exceptional on offense is often seen as less important. And through 208 MLB games, Arcia’s reputation has lived up to the billing. While his defense has been somewhat of a mild disappointment (just 5 defensive runs saved through his first two seasons), his glove has still been far superior than his bat. The 23 year old has posted 79 wRC+ with a .133 isolated power (.140 is considered average) during his first 764 plate appearances. To put that in perspective, only 12 players with at least 750 plate appearances during the 2016 and 2017 campaigns have produced a lower wRC+. Suffice it to say, Arcia has gone through his fair share of struggles at the plate. Arcia’s biggest problem is his knack for hitting the ball on the ground, as he’s hit a grounder in more than 52 percent of his plate appearances. And, of course, it’s impossible to hit a home run that flies over the fence when it’s on the ground, which is why Arcia has just 19 home runs to his name. So therein lies the problem with the title of this post. How can Arcia possibly smack 25 dingers when his profile has always suggested he’s incapable of such a feat? Let’s first start by looking at Arcia’s first- and second-half splits of his batted ball data. Interestingly enough, Arcia’s fly-ball rate dropped at a rather significant rate in the second half, and yet, he essentially matched his home run production in 88 fewer at-bats. Sure, his ground-ball rate shrunk a bit, but the biggest change Arcia made had to do with line drives. He started to hit more of them, but that didn’t really aid him power-wise. According to Baseball Savant, four of Arcia’s 15 home runs came on live drives, with three of them coming after the All-Star break (i.e. the second half). So far, this hasn’t told us much. Let’s dig deeper by looking at how hard Arcia hit the ball in 2017. Looks like we found a little something. After the All-Star break, Arcia apparently decided he was going to make better contact going forward, and that’s exactly what he did. His soft contact rate plummeted seven percent while his hard-hit rate jumped six percent, and as a result, he hit more home runs per fly ball. A big reason for his hard-hitting spree is the fact that he cut down on pop ups by almost 11 percent in the second half. Pop ups are bad, and Arcia’s sudden decision to stop hitting them bodes well for the upcoming season. BIS doesn’t perfectly lineup with Statcast, and in Arcia’s case, the two are vastly different. Personally, I’m more inclined to believe the exit velocity numbers because I actually know how they are calculated, and StatCast, in general, is more broadly used and acknowledged among baseball circles, mainly because it’s more accessible. Arcia doesn’t have enough raw power to hit opposite field home runs, as only three of his 15 home runs went to right field last year despite hitting a fly ball almost 50 percent of the time when he went the opposite way. That’s just an insane number, and not the good kind of insane, especially when you realize his fly-ball rate was less than 20 percent when he pulled the ball. If he managed to flip the two, he could easily hit 20 home runs. But that’s a tall order and a big if. Arcia may never be consistent home-run guy, but he’s certainly capable of being a league-average, 100 wRC+ hitter. And that, along with his defensive skills at shortstop, should make him a valuable player for the Milwaukee Brewers years to come. This entry was posted in Analysis and tagged Milwaukee Brewers, Orlando Arcia on February 19, 2018 by Justin Schultz. 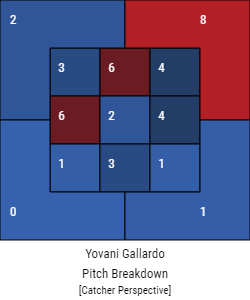 This offseason has been so mind-numbingly slow and boring, I’ve had little else to write about than Yovani Gallardo. When the Milwaukee Brewers inked him to a one-year deal in mid-December, I published a piece on the alterations he’s made and the transformations he’s gone through since being traded away from Milwaukee. And now, about a month later, I’m back at my computer writing words about Gallardo once more. On a totally unrelated note, it’d be nice if the Brewers could make a big acquisition soon. I really don’t want to be forced to write about Boone Logan and J.J. Hoover. But that’s enough complaining. Let’s get back to Gallardo. Per usual, I was fooling around on FanGraphs looking for article ideas when I stumbled upon a statistic that not only jumped out at me, but also surprised me. It has do with the exciting world of pop ups. There were 105 pitchers who finished with at least 130 innings last season, with Gallardo being one of them. And of those 105 pitchers, no one induced a higher percentage of pop ups than the right hander. The former Brewers’ ace induced 25 total pop ups — or infield fly balls as FanGraphs describes them — for a percentage of 16.6 percent. That means that 16.6 percent of the 151 fly balls Gallardo allowed were classified as pop ups. Here’s the infield fly ball rate leaderboard chart from 2017 (minimum 130 innings). Pop ups, as you probably know, are essentially guaranteed outs, making them a dear friend to pitchers and a nasty enemy to hitters. To Gallardo, they were the Shawn to his Cory. And this was a detour from the Gallardo’s usual path. Even though the 31 year old hurled just 130.2 innings, the 25 pop ups he allowed were the most in his career that began in 2007 and that has spanned over 1700 innings. In fact, he’s allowed just 32 pop ups combined in the past three years combined before 2017 began. It’s been well-documented that Gallardo regained some of his lost velocity at some point during the 2017 season, and that just may have contributed to his increase in pop ups. Fast pitches up in the zone are tougher for hitters to get on top of, and if weak contact is made, it’s likely to result in a pop up. Let’s take a look at where in the zone Gallardo pitched that induced the most pop ups. Note: Baseball Savant classifies infield fly balls differently than FanGraphs, which is why the chart above shows more pop ups than what I had previously stated. The majority came from the upper corner of the zone, and like I said earlier, his improved velocity surely made it harder for hitters to make solid contact on those types of pitches. General manager David Stearns has already mentioned that Gallardo intrigued him because of his renewed velocity, so hopefully the latter’s new relationship with pop ups will continue. In the grand scheme of things, however, I’m not sure this means much, if anything at all. Gallardo was still a rather poor pitcher last year. But at the very least, this should be viewed as some sort of silver lining for those who don’t understand why the Brewers wanted Gallardo back on their team. And if that doesn’t do it for you, well, you learned an interesting stat about one of the best pitchers in Brewers franchise history. This entry was posted in Analysis and tagged Milwaukee Brewers, Pop ups, Yovani Gallardo on January 15, 2018 by Justin Schultz. Jonathan Villar put together a terrific August. His 146 wRC+ led the team and ranked as the 45th-highest mark of all MLB players whom have had at least 50 plate appearances. Villar played so well in August that manager Craig Counsell has been inserting him into the lineup on a playoff-hopeful team almost on a daily basis. Yes, Villar has been raking lately. But this article isn’t about how good he is. Instead, the next few hundred words will focus on his miserable and not-so-surprisingly awful 2017 season — his hot August notwithstanding. If you think 55 plate appearances is a decent enough sample size to think he’s a changed player, this piece probably isn’t for you. In late February, the Milwaukee Brewers offered Villar an extension worth around $20 million in guaranteed money. The second baseman was coming off a 3.1 WAR season in which he hit 19 home runs on his way to a 111 wRC+. He proved he could be constant threat on the bases, as he used his .369 on-base percentage to steal 62 bags in 80 attempts. Naturally, the Brewers wanted to keep him around. They even waived Scooter Gennett in order to make sure Villar had a permanent spot in their lineup. However, somewhat surprisingly, Villar passed on the extension, settling for a $500,000 salary instead of the millions he could’ve made. He instead chose to bet on himself and his future, most likely thinking he could garner more money with a subsequent strong season. Villar bet on himself, and Villar lost. As of Sept. 5 Villar has been worth -0.4 Wins Above Replacement, well below replacement level. In other words, only 10 players with a minimum of 400 plate appearances have performed at a lower level than the Brewers’ infielder. In case you’re still not getting it, Villar is the 11th-worst player in Major League Baseball this season. Let’s compare his last two seasons. Villar’s statistics across the board have plummeted. He went from a hitter who created 19 percent more runs than league average, to one that doesn’t warrant a spot on the major league roster. A lot of that has to do with his discipline at that plate. His walk rate has dropped by five percent and his strikeout percentage — which was already high — has ballooned to 30.1 percent, which is the 10th-highest rate in MLB. Overall, Villar’s made considerably less contact, and has suffered more bad luck on the balls he has managed to put in play. With a career groundball rate of 56.7 percent, Villar always been a ground-ball batter. And he used that to his advantage in 2016, hitting a remarkable .313 on grounders. Even the average fan could tell you that mark was probably unsustainable going forward. And they’d be right. This year he’s hitting just .272 on ground balls, down 41 points, which is why his BABIP is has fallen almost 50 points as well. There was just no way Villar could’ve duplicated his 2016 season. He’s a strikeout machine without enough power to make up for it, and without his ability to get on base via the walk, his value dwindles. And that’s exactly what happened. But even my projections didn’t expect him to fall of a cliff and drown in the ocean. My projection system (RW23) pegged the Brewers’ second baseman for regression, but still had him as a high-OBP guy with decent enough power for a middle infielder. I don’t think anyone foresaw his complete meltdown at the plate. Now, I don’t blame Villar for having confidence in himself and rejecting the extension the Brewers offered. I mean, more power to him. The payoff had the opportunity to be enormous. But as the 2017 comes to an end, it’s hard to believe he doesn’t regret taking the money. But don’t get me wrong; he still has time to prove he is, in fact, the player he was in 2016. At 26 years old, the Brewers would be wise to keep giving him chances, as young players are incredibly important assets. He isn’t eligible for free agency until 2021, and although he’ll enter arbitration this winter for the first time in his career, he won’t cost the team very much. Expect Villar to play a utility role for the Brewers in 2018, but to think he’ll be as valuable as he was in 2016 or as useless as he’s been this season, is a little outlandish. His true talent level is somewhere in the middle, and hopefully he consistently displays that in the years to come. This entry was posted in Analysis and tagged Jonathan Villar, Milwaukee Brewers on September 6, 2017 by Justin Schultz.